3 Day course in border work, designing your own borders, unique designs, bending pattern + stripe carpets along with many other unique tricks. This course is only available to installers who have previously completed the FloorSkills level 2 course. Level 3 Carpet is designed for competent floor layers who have completed level 2 carpets with FloorSKills previously. There are many methods unique to FloorSkills which will be demonstrated on this course. Some technics will have been demonstrated on Level 2 Carpet and will be used again on this course. Previous shown methods will not be demonstrated again as presumed you are competent to carry out tasks previously learnt at FloorSkills without guidance. All new methods shown will be demonstrated and completed as normal. 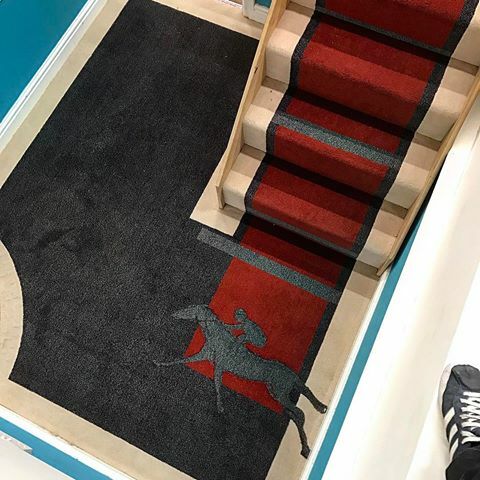 This course includes bespoke border work to flat areas, stairs, winding stairs, B/N steps and also includes ‘bending’ stripe + pattern carpets of woven and secondary backed construction. Prepare training bay ready to receive bespoke handmade border carpet. Installation of bespoke border carpet to include curve forming. Installation of field to border area. Install stripe carpet to winding stairs to include 'bending' and matching stripes.